Diagram of former TriMet bus service on the Portland Mall (5th & 6th Avenues) in central Portland, Oregon. 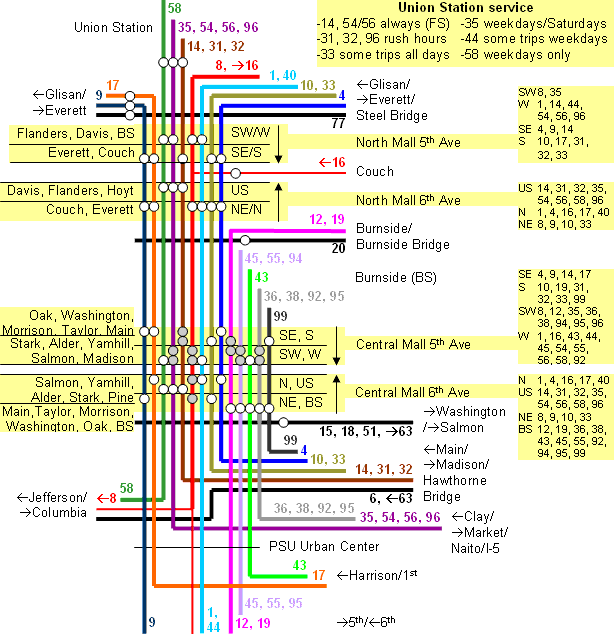 FS=Frequent Service, US=Union Station and BS=Burnside. Lines are grouped based on where they enter and exit the mall. The stop sections are simplified as the same 4-stop/2-block (2-stop in the North Mall) pattern was repeated for the length of mall. Grey-filled squares represent that buses which travel the same route through downtown do not stop at the same stop. Stops are shown on cross streets when they are next to one of the mall streets.